Without a doubt, I am aware of and sensitive to the widespread tragedy of childhood abuse. It seems that in our culture, this inhumane and appalling practice is on the increase. 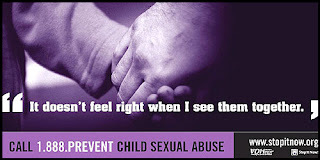 Statistics show that at present, 1 of every 3 females are sexually abused; what a shame! Indeed, something must be done! Now, either these people are just morons or they have bad campaign management because this is just over the line. Can I, as a father, not hold my daughter’s hand as we cross the street? Am I, as a father, to be looked upon with suspicion when I take my daughter’s hand while walking through the grocery store? Should I be considered a predator when I’m holding my daughter’s hand in the airport? Well, that’s what this sign and this activist group suggest. Now, don’t get me wrong, as I said, I’m sensitive to the whole issue of child abuse. But what is this all coming to? The group says that they posted this billboard so that if anyone sees a relationship that they are suspicious of, they can report it. But will this simply become a way to smear and ruin an enemy’s credibility? Will this be a way to make an ex-spouse look bad? There have to be some guidelines to all of this. In a day and age where businesses are constantly trying to put out the most provocative and conversation-stirring ads, this one is just frustrating. Why doesn’t this activist group speak out against organizations like the Man Boy Love Association instead of targeting the sensible and caring dad who just wants to have a nurturing relationship with his children? If they had seen Jesus pick up the little children, in all of their confusion, they probably would have accused Him too. Ridiculous I say, just ridiculous. As for me, I am going to hold my daughters hand. I don’t care what these people or anyone else says or thinks of me! How about you? I do and will continue to hold my daughter's hands, and I will hug and kiss them and tell them I love them. The ad is excessive. There is absolutely nothing wrong with holding one's child's hand. I think that their point is to watch out for relationships that seem too affectionate, but have very badly communicated that point.